April 22, 2018 April 20, 2018 Dan O. Damn men and their insecurities. It was the early 60’s and the United States had space fever. Of course, that was because they were battling the Russians to become the first country to man a spacecraft in outer-space, let alone arrive on the moon, but still. Everyone wanted to get into space, especially most of all, women! And there were quite a few women who wanted to get into outer-space, especially 13 women, who met all of the qualifications made-up by NASA for what it takes to become a female astronaut. These women (Jerrie Cobb, Bernice Steadman, Janey Hart, Jerri Truhill, Rhea Woltman, Sarah Ratley, Jan and Marion Dietrich, Myrtle Cagle, Irene Leverton, Gene Nora Jessen, Jean Hixson, and Wally Funk) all passed with flying colors and were absolutely ready to get out there into outer-space, until they soon realized that their hopes and dreams would be squandered by sexism, prejudice, and unsurprisingly, a society that thought it was best for women to stay in the house, watch the kids, and make dinner, as opposed to manning a spacecraft set for another planet. Many years later, and hopefully, still happy. Oh, how times have, I hope, changed. Mercury 13 is one of those documentaries that keeps a positive and relatively sweet pace for its whole 78 minutes. 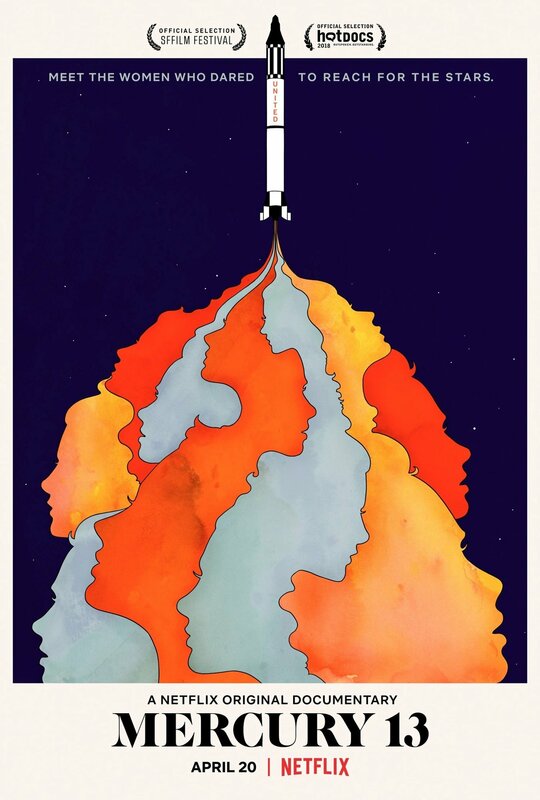 It does dig deep and gets a brutally honest about why these women weren’t allowed to fly for NASA (shocker, it’s sexist males), but it never harps too long on the sheer sadness and injustices. Mostly, it shows what happened, why and does what it can to move on, forgive, and possibly, even forget – much like the 13 women themselves had to do. But underneath it all, you can’t forgive, you can’t forget, and most especially, you can’t move on from it. And if anything, Mercury 13 proves that the issues and injustices of yesterday, still affect us today. Sure, women are now allowed to fly into outer-space and NASA looks a little bit more inclusive on paper, but the fact that they were never allowed to, is troubling. Mercury 13 does touch on this, but once again, it never gets as mean, or as nasty as it possibly should have been; it mostly keeps to the true, undying spirit of these women who, even when they were faced with all sorts of hatred and adversity, still wouldn’t give up on their dreams. And maybe, that’s the message to take away from all of this. Beyond all of the sexism and prejudice, Mercury 13 still gives us a glimpse at 13 women who were, yes, trailblazers, but honest to themselves and their countries. They didn’t give up on their dreams, they didn’t allow for themselves to get knocked down in the dirt, and they especially didn’t let men ruin their hopes and dreams of one day seeing the space beyond our planet. Mercury 13 is as much of a tribute to these women, as much as it’s a glimpse inside sexual-politics of the time, to show us why times needed to change and why men, deep down inside, are just scared and insecure little boys who are afraid that a woman will take their job, their spotlight, and their fortune. Wake up, fellas! Times are ‘a changin’! Consensus: Even beneath the sadness and sometimes disturbing nature of these stories, Mercury 13 still proves to be an enjoyable and somewhat hopeful tribute to these women who weren’t just trailblazers for female astronauts, but women in general. On behalf of men everywhere, ladies, I’m sorry. Thanks for turning me on to this, this looks right up my alley.